Inky Fairy Designs: Back with another TGF Spectactular September Preview! Back with another TGF Spectactular September Preview! Happy Monday! Did you LOVE the sneak peek of the brand new Miss Anya set to be release Sept. 1? I can't wait to show you the rest but for now I have the awesomely cute WS Logan to share with you! He is also part of our Spectacular September TGF release!!! Isn't he just so cool? Seriously, I had to keep my card simple so as not to make him mad - he doesn't look like he'd like too many embellies, ya know, he's a less is more kinda guy I think! haha I just used a few sticker pieces from Bella Blvd. I love their sticker sheets as they have so many cute sayings and shapes perfect for cards! I'm also playing in The Pink Elephant Paper Piecing Challenge as TGF is the proud sponsor this week!!! I paper pieced Logan's hoodie and added some shading with Copics W 1, 2 & 3 to give it some depth. Don't forget about the two new CLEAR stamp sets, "Bantastic" and "Fairy Princess" available in the store now...or perhaps you are waiting to get them with your September Favorites!! Be sure to head over to the TGF BLOG as there is a Wild Sprout Logan up for grabs today, and in case you missed Friday's BIG announcement, click HERE to find out how YOU could become our "Farm Fashionista" of 2011! I am already enjoying all the entries that have come in over the weekend! Super cute, Carissa! I love the colors and the tearing! Great paper piecing and I LOVE the sentiment! Totally cool! Cool as card Carisa. I LOVE Logan's paper-pieced hoodie. Very cool. Your right Miss Carisa, Logan isn't looking for a lot of embellies...he's a simple kind of guy, lol! 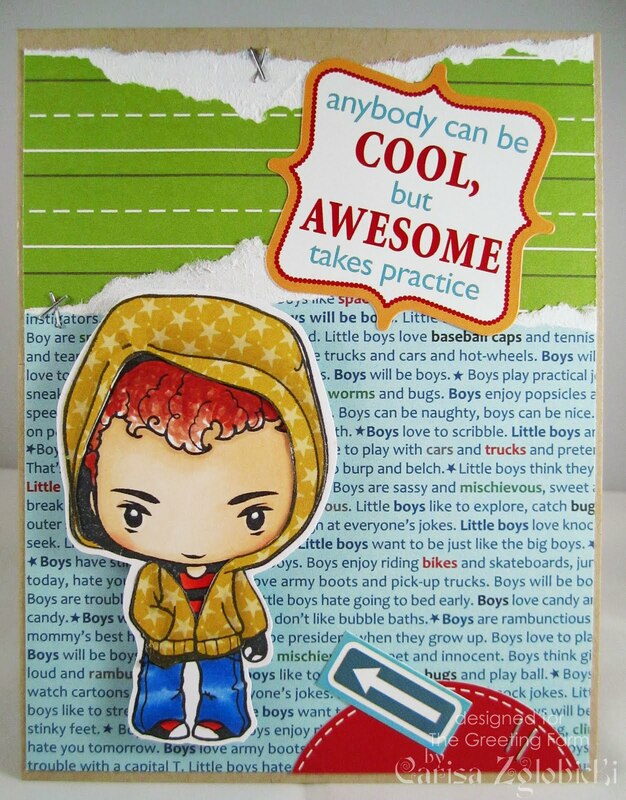 Love your card and the paper pieced hoodie...it's a great touch! Adorable!! Love the use of stickers! Thanks so much for playing with us at CAS-ual Fridays!! How cool! Love the torn edges as it is such a lovely background for this little image1! Thanks so much for playing with us at CAS-ual Fridays! Creeping by with another TGF Sneaky Peek!! Cosmo Cricket Sketch 2 different Ways! No Black Lines & Punches, Punches, Punches! Did you SEE this amazing giveaway?? Adhere in August with Helmar! I can see CLEARLY now at TGF!! Clearly a happy preview day at TGF!! Back with a new Foto Friday weekly post!